Five days after the martyrdom of the Virgin Emerentiana, the parents of the glorious Saint Agnes visited the tomb of their child during the night, there to weep and pray. It was the eighth day since her martyrdom. While they were thinking upon the cruel death, which, though it had enriched their child with a Martyr’s palm, had deprived them of her society—Agnes suddenly appeared to them: she was encircled with a bright light, and wore a crown on her head, and was surrounded by a choir of virgins of dazzling beauty. 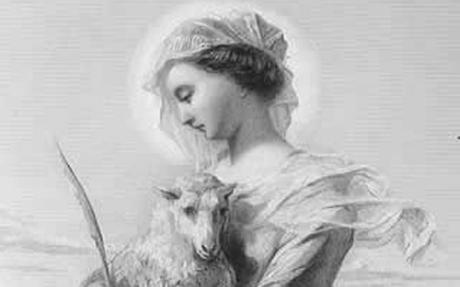 On her right hand, there stood a beautiful white lamb, the emblem of the Divine Spouse of Agnes. Ant. Stans a dextris ejus Agnus nive candidior, Christus sibi Sponsam et Martyrem consecravit. Ant. Standing at her right hand as a Lamb whiter than snow, Christ consecrated her to himself as his Spouse and Martyr. ℣. Specie tua, et pulchritudine tua. ℣. With thy comeliness and thy beauty. ℟. Intende, prospere procede et regna. ℟. Set out, proceed prosperously, and reign. Deus qui nos annua beatæ Agnetis Virginis et Martyris tuæ solemnitate lætificas: da quæsumus, ut quam veneramur officiæ, etiam piæ conversationis sequamur exemplo. Per Christum Dominum nostrum. Amen. O God, who rejoicest us by the yearly solemnity of blessed Agnes, the Virgin and Martyr: grant, we beseech thee, that we may imitate her life, to whose memory we pray this honor. Through Christ our Lord. Amen.